education from East Central University in 1989. My husband,Kenny Bare, and I have been at Velma-Alma schools since 1998. Before making our home in Velma, I taught in Ada, Cushing, Moore, Apache, and Duncan. We have three children. Our oldest, Katie Pogue, is a 5th grade teacher at Velma-Alma. 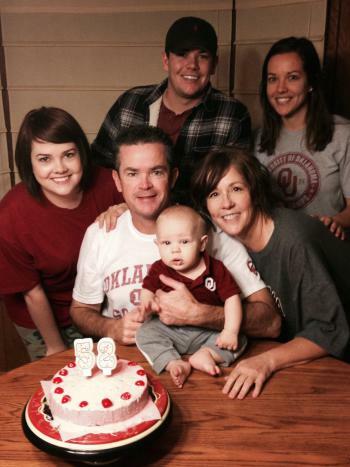 Our other two children, Alexandra and Dallas, are students at the University of Oklahoma. Alex graduated in December of 2014 with her Bachelor's in Journalism with a concentration in professional writing. She is currently working towards her Master's in English Education. Dallas is set to graduate in 2017 with a degree in Communications. On May 28, 2014 Katie and Adam blessed us with our first grandchild, Dawson. He is so much fun and has kept us young and on our toes! We’re Sooner fans, but we also love the Dallas Cowboys and the OKC Thunder. We have a black cat named Maxine who loves to hunt birds and hog the bed. ge every year, but I never get tired of helping them learn. So many of my students have grown to do successful things, one of them is even my son-in-law! Of all of the places we’ve lived, Velma-Alma will always be my home.